Take a Book, Return a Book. Just as I opened the little glass door to look at the books, the entire family that owned the library came out of their house. I felt awkward, but they were very welcoming, and they encouraged each of us to borrow a book. I explained that I was visiting from Boston, and would not be able to return the book. Not a problem! they said. It turned out that they were such voracious readers that they had run out of places to store books in their home. Their situation was so extreme that they actually had an unused shower stall packed solid with books! When this family encountered their first Little Free Library, they recognized the book exchange as a solution to both their prodigious reading habits and book storage problems — they would share and trade with their neighbors! I happily left with two books, vowing to establish a Little Free Library in my own yard one day. Little Free Libraries come in all shapes and sizes. You can purchase a standard Little Free Library at www.LittleFreeLibrary.org, but many people use their imagination and ingenuity to create surprising and wonderful Little Libraries. For me, this was an intriguing creative challenge. Whenever I visited a secondhand store, flea market, builder’s supply, or hardware store, I looked for objects with Little Free Library potential. I surveyed my own eccentric collection of found objects (which my husband Alphonse affectionately refers to as “junk”) with newly purposeful eyes. Eventually I happened upon a weatherbeaten vintage jelly cabinet which felt just right, except for its solid wood door — no one would be able to see that there were books inside. Alphonse believed that was easily remedied, so we hauled it home from the flea market. A discussion of watertight windows brought portholes to mind. I googled “porthole” — and found that I could purchase one for $11 on the web! So I did, and Alphonse installed it. The four tub claw feet I had saved from a long ago bathroom renovation now appeared to be viable building materials. The porthole and tub feet suggested a nautical theme, and a dock rope cleat became the door handle. We painted the library, lined it with National Geographic maps, and attached the claw feet. Unfortunately, I am an artist, not an architect or an engineer, and here is where we met with two major difficulties. The first was that the claw feet looked fabulous, but made the cabinet unstable. The second was the conundrum of roof construction. We had to let the library sit for a few weeks while we thought these things over. In the meantime, I decorated. I whittled a fish, adorned the sides with upholstery tacks and colorful faucet washers, and spelled out “FREE LIBRARY” with Scrabble tiles. Then one day, while rummaging in the upper reaches of our office supply cabinet, I happened upon some ancient leftover blank CDs. These would make beautiful roof tiles! And the geometry of the step-stool I was standing on gave me the idea to attach stairs to the back of the Library to stabilize it. Voila! I was proud and excited to put it outside. Officially, my Porthole Library is Little Free Library Charter #31493. You can find it on the world map at www.littlefreelibrary.org in zip code #02132. The first two books on the shelf were the books I borrowed in Laguna Beach. The library is barely a month old, and despite its quiet location, many books have been borrowed and exchanged. I enjoy overhearing passers-by exclaim “It’s a library!” when they see it for the first time. I use it as an excuse to talk to perfect strangers at the bus stop, and I chronicle its activity on Instagram: #portholelibrary and www.BookCrossing.com. I look forward to the books I will read and stories I will tell about my Little Free Library! 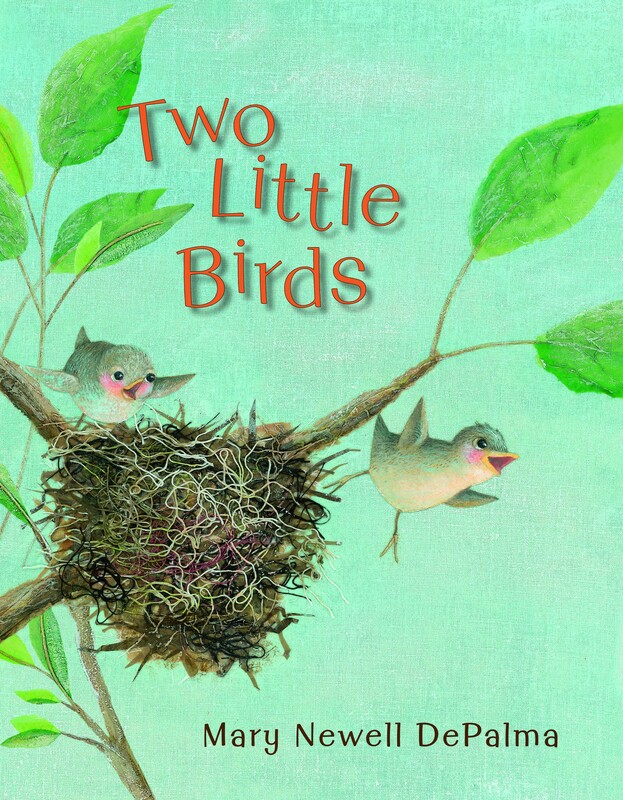 Mary Newell DePalma is the author of many children’s books, including Uh-Oh!, Bow-Wow Wiggle-Waggle, and, most recently, Two Little Birds, a sweet story about nature’s patterns and about growing up. Learn more about her on her website, MaryNewellDePalma.com. You are such an inspiration, Mary, for all your contributions to making this world a better place!! Not only are your books such a joy to own, but, your sharing with others is so rewarding. Kudos to you and Alphonse and Kepley!! Have fun!! Greetings from Laguna Beach! We are so happy to have been your inspiration to create a Little Free Library. Yours is beautiful, charming, and unique. We hope it brings you many new friends. to have a little library in front of it.